ZP Raigarh District MGNREGA Recruitment Exam 2017: Mahatma Gandhi National Rural Employment Guarantee Scheme, ZP Raigarh District has released notification to recruit candidates for Program Officer and Technical Assistant vacancies under Zilla Panchayat Chhattisgarh. MGNREGA Chhattisgarh has released total 67 posts in Raigarh District. Candidate should have minimum age of 21 years and maximum age of 35 years as on 01-November-2017. Application forms for the Technical Assistant and Program Officer posts available at http://mgnrega.cg.gov.in/. Download the application and submit to the Chief Executive Officer, Raigarh District Panchayat, Chhattisgarh before 05th December-2017. Selection of candidates for Zilla Panchayat Raigarh Dist Recruitment is based on their qualification marks and Interview. Pay Scale for Program Officer is Rs. 28,080/- and for Technical Assistant is Rs. 23,010/-. 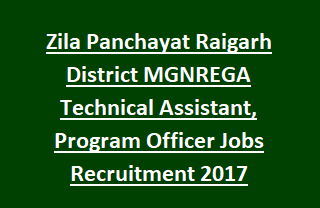 Further Details of Application process, Age limits, Selection Process, Qualifications, Pay scale details regarding Zila Panchayat Raigarh District MGNREGA Recruitment of 67 Program Officer, Technical Assistant vacancy are mentioned below. Last date for submission of MGNREGA application form: 05-December-2017. Total no of vacancies are 67 posts. 1. Program Officer: 01 post. Category wise vacancies are given in the notification. Minimum Age of the candidate should be 21 years and maximum age limit is 35 years as on 01-November-2017. Relaxations in age admissible as per Govt rules. Technical Assistant: BE/ Btech in civil/ Agriculture or Polytechnic Diploma in Civil or BE/ Diploma in any branch or BSc Maths or MSc in Physics/ Maths. Check the MGNREGA official notification for other post qualification details. Selection of applicants for ZP Raigarh District MGNREGA Recruitment Jobs will be based on academic qualification marks and Interview. See the notification for more selection procedure details.